If you need to move between companies in a multiple company database, this is how you change the company code, or number. You may also have found that you're in the wrong company. It's possible someone attempted to create a new company or found the prompt to enter a new company code and didn't know what to do. One of the first signs of this is that your login IDs don't work or if they do, all guest information, rooms, charges, etc. are gone. It's typical that this only affects a single terminal. If you haven't had software updates in several years, your screen may ask you to hit the Escape key to setup. If you have the newer window, click the button Company Set-up. 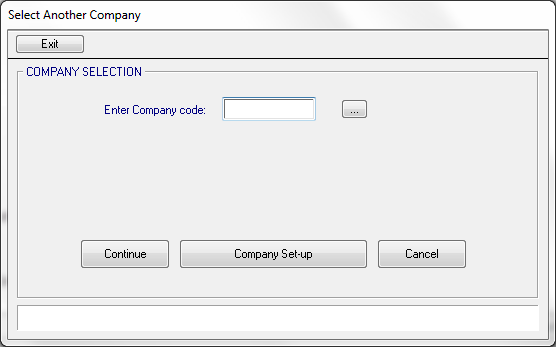 Once in the Company Selection screen, enter the company code to which you want to change. Click Continue. The default company code is 01. It's always a 2 digit number from 01 to 99. If you're not sure what it is, use 01. 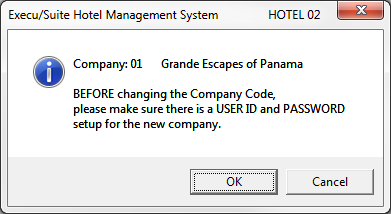 If the company code is valid, you'll see a prompt that gives you the new company name and warns you that you should have a USER Id and PASSWORD with access to this company. If this is a company you normally access, click OK.